Ruf Automobile is proud to introduce the CTR 2, the latest evolution of its ultra high performance automobiles. The CTR 2 is based on the Porsche 993 chassis with a powerplant inspired by the magificent turbocharged Group C Porsche 962. Manufactured at Ruf Automobile GmbH, it becomes the 2nd generation CTR; thus, its name: the CTR 2. 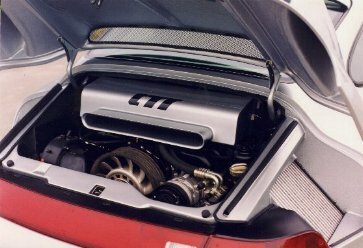 With its air-cooled sohc flat-6 producing 520 Horsepower (382 kW) and an astonishing 505 lb-ft (685 Nm) of torque, the CTR 2 has few peers, even among others of the world's elite cars. Not only does the CTR 2 offer truly superlative levels of performance, its aesthetics set new standards for Ruf's Pfaffenhausen, Gemany, facility, owing its sleek purposeful enhancements to the Ruf-Design Team. Details of the CTR 2's coachwork are at the same time subtle, yet striking. The rain gutters are gone, the new roof line more attractive and providing reduced wind noise at elevated speeds. 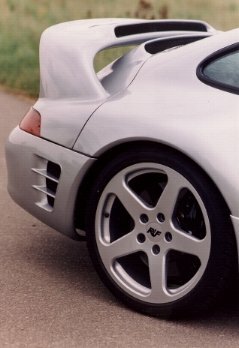 Ruf-designed Sport Mirrors hug the A-pillars. And, most noteworthy, the CTR 2's dual-purpose rear wing combines its aerodynamic function of generating downforce for enhanced stability while inlets in its leading edge capture and channel an excellent airflow directly to twin, inside-mounted air-to-air intercoolers. The sensuous shape of the Ruf CTR 2's rear deck sets it apart. The CTR 2 is a cut of the Nineties and beyond, available and road-legal in all countries around the world. Its TAGtronic engine management, catalytic converted and oxygen sensors team up to earn it full Certification by the U.S. Envirornmental Protection Agency. Its Integrated Roll Cage stiffens an already robust structure and provides an extra degree of passive safety. The CTR 2's ultra high performance tires are of extremely low profile, yet of the latest tire technology giving state-of-the-art responsiveness and grip with no sacrifice of ride comfort. Its 19-inch wheels are of forged magnesium offering weight savings with greater strength than those of the cast variety. Its braking system employs oversized discs of carbon fibre, the first road use of this racecar technology.